It’s been fourteen years since I lay face-down at the top of the staircase, ready to punch Mark Madsen in the face. Tyson Wheeler had just missed the first of three free throws that would have tied the Elite Eight game between 8th-seeded Rhode Island and 3rd-seeded Stanford, and I was beginning to experience the other side of March Madness. URI had blown a seven-point lead with under a minute to play, and Madsen’s aggressive, over-the-top celebration (fast forward to 0:16) was still ringing around in my head. If Wheeler had hit all three free throws, (he was fouled on a desperation three with 5 seconds to go), he would have given the Rams five more minutes to reach the Final Four–a phrase that remains mind-boggling to this day. I wasn’t really a URI fan; in fact, the next year I would begin my journey as a die-hard Kansas fan and probably would have been upset that Rhode Island took out the Jayhawks in the second round. 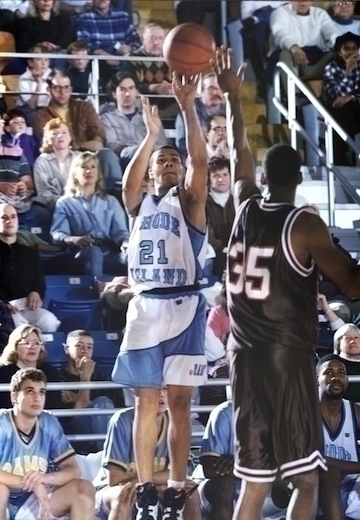 But on that March day in 1998, nothing would have made this basketball nut-job from Connecticut happier than watching the Atlantic 10 champion Rhode Island Rams take out mighty Stanford and advance to an unthinkable appearance on the game’s biggest stage. Wheeler short-armed the second free throw, then missed the third intentionally, only to watch it bounce out of bounds. The game was virtually over, Rhode Island had blown a seven-point lead with a minute to go, and I slumped back face-down on the stairs, heartbroken. Of course, I didn’t tell Tyson Wheeler any of this when I caught up with him recently to ask, “Where are you now?” (The answer: he’s an assistant coach at Fairfield University). See, some things are best left in the past. And then other things…. ROUNDBALL DAILY: What comes to mind when you think back to that 1998 team? WHEELER: Just how much fun it was. You know, playing in the moment. Coming together as a team, and doing something no other Rhode Island team had done. It was a great experience to go through with the guys that we had on that team, because almost all of us were together for 3 or 4 years so we basically grew up together as brothers. It was fitting for us to go that far in ’98. RD: Do you think that connection is what made you guys so good on the court? WHEELER: Definitely. I think we all set a goal from the first day we stepped on campus to be really, really good and put URI on the map. We all felt that we could play at a high-major level, but for some reason we didn’t get recruited at a high-major level. We all played with a chip on our shoulder to show everybody that we could compete with the best teams in the country, no matter who they were. RD: How excited were you guys when you heard that Jim Harrick, who won the title at UCLA in 1995 and had that type of pedigree, was coming to Rhode Island? WHEELER: Oh, very excited. Actually Antonio and I were on the committee to pick a coach and we were so excited because like you said he just won a championship. 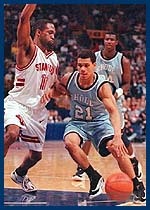 UCLA had a guard like myself in Tyus Edney, so that got me excited, because we both had a similar style of play. We liked to push the ball, we liked to shoot, we liked to penetrate. I knew it would be a great fit for myself. It also helped Cuttino Mobley out a lot, to expand his game and show the different ways he could play and show his talent. RD: What was it like playing for coach Harrick? WHEELER: It was a great experience. You know, it was very different than Al Skinner’s style of play. Something I had to get used to. I enjoyed the UCLA offense. RD: Was there a moment during that season that you realized your team was coming together? WHEELER: I don’t know, we had our bumps and bruises early on in the season. But we finally figured out how to run the type of offense that coach wanted us to run, and I think we just had a type of swagger where we thought we could compete with anybody. Jim Harrick brought his offense in, but we had our team set and our guys. We knew what each other could do on the court. I think we were well-prepared, we were a veteran team, and whether Jim Harrick was there or Al Skinner was there, we would have went far in the tournament. RD: What do you think made Harrick so successful? He never had big-time recruits or McDonald’s All-Americans, but he won everywhere he went. WHEELER: I think it was his coaching style, and the offense that we ran. It was a free offense, you had to know the game, you had to have a high basketball IQ. I think he prepared us like that. You also had to have guys who could shoot the ball. RD: When you think about the Kansas game (Note: URI upset Paul Pierce and top-seeded KU, 80-75, in the second round of the ’98 tournament), what jumps out at you? WHEELER: Just the way we were competing against them. I can still remember looking at them at some point during the game and thinking, these guys really feared us. You could tell by the way they looked, the way they were playing, that they knew they were in trouble. It’s funny because, I still see Paul [Pierce] from time to time. I’ve had my son with me, and he’ll say, ‘Your father ended my college career.’ That always sounds good coming from him. RD: Do you think more about that game or the Stanford game [in the Elite Eight]? WHEELER: I think about both, but it hurts more when you lose, so you tend to think about that more. That was my last college game and we were right there to go to the Final Four and we didn’t complete the game. RD: Do you ever watch that game on YouTube? WHEELER: Nah, I haven’t watched it in a while. I’ve watched it a couple of times, but I have to turn it off when things start going bad. It’s a game that we will never forget. RD: Do you think about those missed free throws at the end? WHEELER: Not too much anymore. When I was still playing, it crossed my mind a lot when I was shooting foul shots. I struggled from the foul line for the next few years after that, because I would always think about that. RD: Did you ever get over it? WHEELER: Yeah, y’know, my last five or six years I shot about 85-plus percent. I got over it, and I started knocking down foul shots like they were layups. RD: What would you tell a kid on your team if he was in that type of situation at the end of a game? WHEELER: I would definitely tell a kid to think of something positive, or say something positive when you’re about to shoot. Have a keyword that you can go to every time. So you’re not thinking about the shot, you’re just thinking about the word and following through and making the shot. That’s what I started to do. I started to get up there and say, ‘Be the hero.’ The first couple of years after I missed those shots, I was thinking about, ‘I have to make this shot,’ or ‘Don’t miss, don’t miss.’ And I think that kind of messed me up. So I just came up with a keyword and stuck to that, and it helped out tremendously. RD: A lot of your teammates from ’98 are now coaches. Why do you think that is? WHEELER: I think we have a passion for the game. We came up with great coaches like Al Skinner, coach Ed Cooley (now at Providence), coach [Bill] Coen (now at Northeastern), and coach Tim O’Shea (now at Bryant). We have that passion for the game, and we want to make players better. And it’s totally different from playing. You’ve got to really, really think the game and come up with concepts to beat the other team. As a coach, you have to make sure your guys are well-prepared. RD: What is your ultimate career goal? WHEELER: I definitely want to be a head coach one day. That’s my goal. Right now, I’m still learning and I have a lot more to learn, but my goal is to get to the top of this profession.